When you welcome a new little one to your family, but have an older child who may still need close attention or the aid of a stroller, it can be hard to figure out a good solution. There are so many options out there, from double seat strollers, to sit and stand strollers, and the like. But even with so many options, it can be hard to find a double stroller that won’t break the bank or take up all of the space in your car. 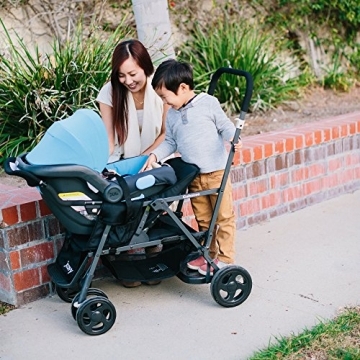 Finding the right stroller to fit your family and your budget can be a trick, but the Joovy stroller company might have a solution for you. 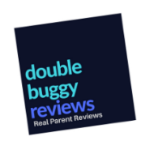 In our Joovy Caboose Graphite Stand on Tandem Stroller review, we will discuss the benefits, specifications, pros and cons of this sit and stand tandem stroller by Joovy and provide our final verdict, to help you determine if this might be the solution to your family’s stroller needs. 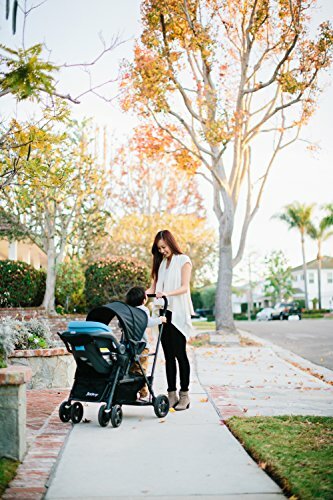 Size: one of the greatest benefits of the Joovy Caboose Graphite Stand on Tandem Stroller is that, for a double, it is incredibly light and compact. It weighs only 27 pounds and its dimensions are approximately 31.7×20.3×10 inches! That is approximately the same foot print as many single strollers, such as the Graco jogging stroller.Additionally, when it folds up, it is compact and stores like a single as well, fitting into even smaller trunk spaces. For most people, the biggest problem about double strollers is their enormous and impractical size. 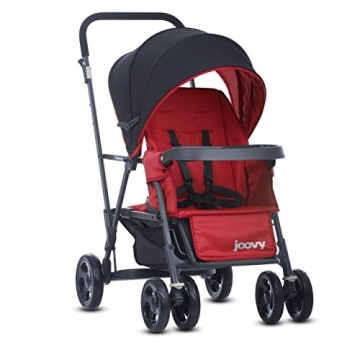 With this Joovy stroller, you don’t have to worry about its size at all. Versatility: another great and somewhat unique characteristic of the Joovy Caboose Graphite Stand on Tandem Stroller is the versatility it offers.First, the stroller comes with a universal infant car seat adapter that can accommodate most brands and types of infant car seats (and their website has a full list of all the car seats it can accommodate). So you don’t have to wait for your new little one to be big enough for the regular seat – you can attach the car seat adapter and use the stroller straight away. You also don’t have to worry about buying a car seat specifically made by Joovy. The second way that this stroller is versatile is that if your older child is still a bit too young for you to use the bench seat comfortably, you can purchase a caboose rear seat that perfectly fits behind the front seat and allows you to strap your child in. The added caboose seat is a fully functioning second seat that even allows for different recline positions. This is perfect if you have a toddler whom you may not want to be wandering as freely as the sit and stand caboose would normally allow, and/or who may need longer, fuller rests from walking. As mentioned above, the specs on this stroller with regards to size are more akin to the typical single stroller, rather than a double. It weighs in at approximately 27 pounds and is 31.7×20.3×10 inches – remarkably light weight and compact for a double. Despite being so small, it can still accommodate up to 90 pounds between the two sitting/standing areas. It also has sturdy, foam wheels that can’t go flat like air filled bike tires, but which are much sturdier and smoother than the little plastic wheels on many of the smaller strollers. The front seat can be set in three different positions, though when it is fully reclined, there will be little to no room for the older child to use the bench or standing platform in the back. 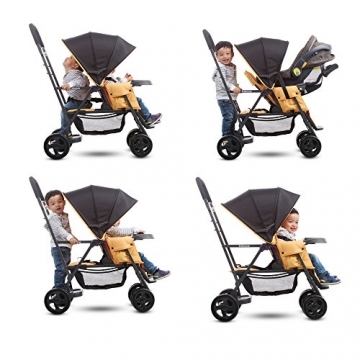 There is a very substantial sunshade that covers both the front seat and even the child sitting in the back, which is much better than most of the sunshades included with strollers. The Joovy Caboose Graphite Stand on Tandem Stroller has a little less with regards to some of the bells and whistles. While it does come with one child tray for the front seat, it does not come with a parent tray. You can opt to buy Joovy’s cloth parent organizer specifically made for the Caboose, but it is not included in the purchase of the stroller. It also uses a “two-hand” folding mechanism, instead of a “one-hand” option, but considering you usually need to hands to hoist it into the back of the car or put it in storage anyway, this really is not a big deal. Very compact: by now, it is obvious – one of the greatest “pros” about this stroller is that it is pretty much the size of a single with all of the functionality of a double. This makes it extremely practical and easy to use. Perfect for the parent having to keep track of two littles at once. Accessories make it extremely versatile: another major plus is the additional accessories (some which are included and others which must be purchased) which make it so versatile. If you still have a baby in a car carrier, you can attach the car seat adapter and still use one stroller for both of your littles. If your older child is not quite mature or strong enough for the bench seat and standing option, you can purchase a caboose seat to install and have a fully functioning two-seater while you need it. 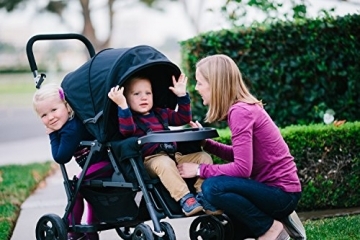 The stroller can accommodate whatever stage your two littles are in. 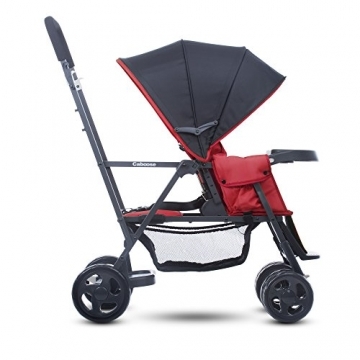 Cost: this stroller is also remarkably cheap compared to most double strollers, and is even cheaper than many singles. Some “standard” options must be bought: as mentioned in the specifications, this stroller does not come with a parent organizer, and the second back seat must be bought if you need something more restraining than the bench seat. Reclined front seat impacts space in back: when the front seat is reclined partially, it will seriously limit the space in the back sitting area, even if you are just using the bench. If the front seat is fully reclined, the second child in the back may not be able to fit on at all. While you may have to make a couple extra purchases to have all of the options you would like, and while its smallness may mean the recline of the front seats cramps the style of the child in the back, considering its versatile functions, price, and practical size and ease of use – this is an excellent option. You can essentially get a fully functioning two seater for when you need it which can transition to a one seater with a bench and standing area when your older child is ready. It can grow with your family, and since the cost is so affordable, you won’t mind spending a bit more to get the parent organizer and second caboose seat if you need to. If this model feels like the right one for your home, then what are you waiting for? Buy it now!